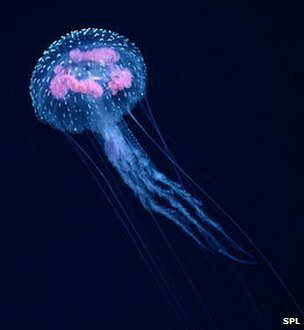 Bioluminescence describes the light that some living creatures such as fireflies and jellyfish emit from their cells. Harnessing these reactions has already transformed key areas of clinical diagnosis and medical research. But scientists are now looking at whether this “living light” could help enhance food crops, detect pollution or even illuminate our journeys home. On a night in January 1832, off the coast of Tenerife, a young Charles Darwin wandered up on to the deck of the HMS Beagle. As the young naturalist looked out to sea, he was struck by the unearthly glow emanating from the ocean. “The sea was luminous in specks and in the wake of the vessel, of a uniform, slightly milky colour,” he wrote. Fluorescence: Energy from an external source of light is absorbed and re-emitted. Fluorescence can only occur in the presence of this light source; it cannot happen in complete darkness. 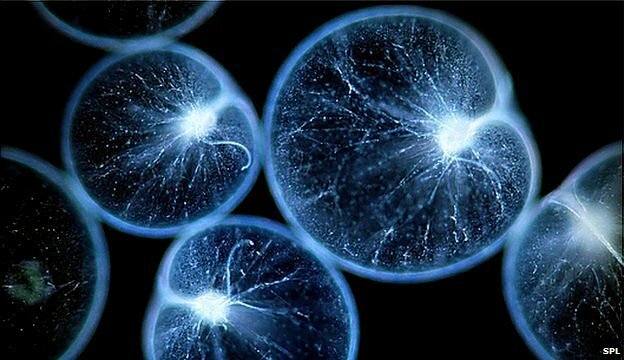 Bioluminescence: The energy for light production comes from a chemical reaction in living cells, as opposed to the absorption of photons as happens in fluorescence. Darwin was almost certainly describing the light emitted by tiny marine organisms called dinoflagellates. His accounts of this phenomenon, known as bioluminescence, were unearthed by Prof Anthony Campbell in hand-written notebooks stored at Cambridge University. While Darwin was one of the first modern scientists to document the phenomenon, it would be more than a century before it was put to practical use. Prof Campbell, from Cardiff University, carried out pioneering research throughout the 1970s and 1980s leading to the discovery that living creatures produce this light using special proteins called luciferases. The proteins take part in a chemical reaction in the cells, which is responsible for the light emission. “When I started researching bioluminescence 40 years ago at the [Cardiff University] medical school, a lot of people raised their eyebrows and said: ‘What the devil is this guy doing working on animals in the sea? He was brought from Cambridge to do medical research’,” Prof Campbell explains. But he was able to spot the phenomenon’s potential. Having discovered the proteins involved in bioluminescence, he realised that by combining luciferases with other molecules, it was possible to harness this light emission to measure biological processes. This would pave the way for something of a revolution in medical research and clinical diagnosis. For example, by attaching a luminescent protein to an antibody – a protective molecule produced by the body’s immune system – it could be used to diagnose disease. This allowed clinicians to dispense with the radioactive markers that had previously been used in such tests. “This market is now worth about £20bn. If you go into a hospital and have a blood test which measures viral proteins, cancer proteins, hormones, vitamins, bacterial proteins, drugs, it will almost certainly use this technique,” Prof Campbell told BBC News. Bioluminescent proteins are also tools in drug discovery and have found widespread applications in biomedical research, where they are used to study biological processes in live cells. “If you’ve got a university department that doesn’t use these techniques, they are not at the cutting edge,” says Campbell. Other applications are on the horizon. At the University of Lausanne in Switzerland, Prof Jan van der Meer has developed a test for the presence of arsenic in drinking water using genetically modified bacteria. Arsenic contamination of groundwater is a pernicious problem in some parts of the world, especially in Bangladesh, India, Laos and Vietnam. Prof van der Meer’s microbes have been engineered to emit light when they come into contact with arsenic-containing compounds. Potentially contaminated water is injected into vials, activating the dormant GM bacteria. The extent to which the microbes emit light is then measured to provide an indication of arsenic concentrations in the water. The work is now being commercialised by the German firm Arsolux. Prof van der Meer says the bacterial-based kits cope well with multiple samples, require fewer materials than standard chemical testing field kits, and are easy to prepare. So called rainbow proteins (a spin-off from work into bioluminescence), which change colour in response to particular compounds, are also an option for detecting environmental toxins, or the potential agents of terrorism. There are already several consumer applications of bioluminescence: one US firm has made use of it to manufacture luminous drinks for sale in nightclubs. And researchers have even modified plants so that they emit light. Bioluminescent crops could indicate when they require water and nutrients, or warn of disease and infestation. However, the controversy surrounding GM foods has so far prevented these ideas from taking hold. 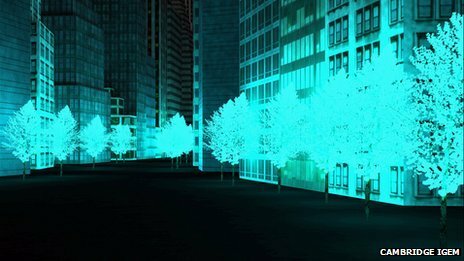 A few years ago, a team of undergraduates at Cambridge University researched the idea of luminescent trees that would act as natural “street lamps”. “What we achieved in that project was to put together some DNA which allowed bioluminescence, to show that it worked in [the bacterium] E. coli, and to submit it to the ‘parts registry’ which holds this DNA so anyone else can use it in future,” team member Theo Sanderson told BBC News. 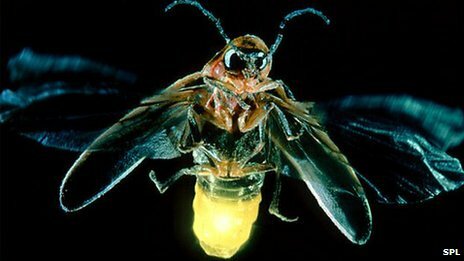 Previous efforts to create light-emitting plants in the lab have made use of a luciferase gene derived from fireflies. But these plants can only glow when supplemented with an expensive chemical called luciferin. The method used by the Cambridge team is attractive because it is based on bacterial systems which produce their own fuels for luminescence and so can be fed normal nutrients. In 2010, a separate team published a study in which they were able to demonstrate that such methods could be used to create plants that glowed without the need for chemical supplements. The US-Israeli team of scientists inserted light-emitting genes from bacteria into the plants’ chloroplasts – the structures in their cells which convert light energy from the Sun into chemical fuel. Mr Sanderson, who now works at the Sanger Institute near Cambridge, said this was a good choice because chloroplasts are essentially bacteria that have become incorporated into plant cells, so they can easily express the microbe-derived gene without the need for other modifications. But researchers will need to find ways to boost the light emission from such lab organisms if GM trees are ever to light our way through the urban jungle. Prof Campbell says the potential of luminescent proteins in drug discovery and medical research has not yet been fully exhausted and he is currently collaborating on a project to use luciferases to research Alzheimer’s disease. Bioluminescent creatures might also provide a convenient means of studying environmental changes in the sea. Some animals obtain the light-emitting chemicals they need from the organisms they eat. So studying the interactions between these species might allow scientists to detect changes in marine food webs. Despite the impact on clinical diagnosis and research, Prof Campbell points out that he has only ever received one grant to research bioluminescence. Nevertheless, he says it is a “beautiful example of how curiosity – quite unexpectedly – has led to major discoveries in biology and medicine. And it has created several billion dollar markets”. Astronomers have found evidence for a planet being devoured by its star, yielding insights into the fate that will befall Earth in billions of years. The team uncovered the signature of a planet that had been “eaten” by looking at the chemistry of the host star. They also think a surviving planet around this star may have been kicked into its unusual orbit by the destruction of a neighbouring world. Details of the work have been published in Astrophysical Journal Letters. The US-Polish-Spanish team made the discovery when they were studying the star BD+48 740 – which is one of a stellar class known as red giants. 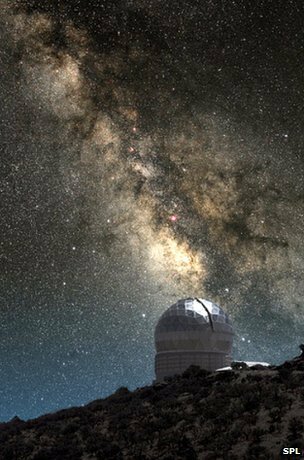 Their observations were made with the Hobby Eberly telescope, based at the McDonald Observatory in Texas. 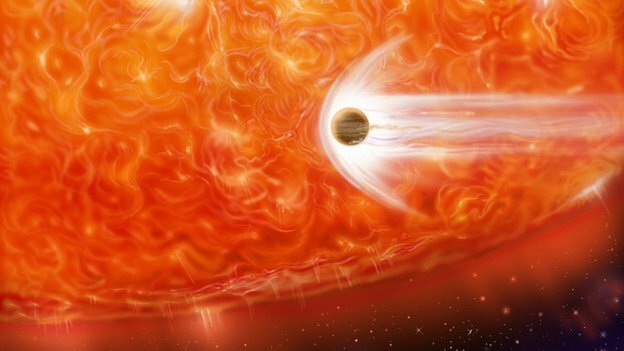 Rising temperatures near the cores of red giants cause these elderly stars to expand in size, a process which will cause any nearby planets to be destroyed. “A similar fate may await the inner planets in our solar system, when the Sun becomes a red giant and expands all the way out to Earth’s orbit some five billion years from now,” said co-author Prof Alexander Wolszczan from Pennsylvania State University in the US. The first piece of evidence for the missing planet comes from the star’s peculiar chemical composition. Spectroscopic analysis of BD+48 740 revealed that it contained an abnormally high amount of lithium, a rare element created primarily during the Big Bang 14 billion years ago. Lithium is easily destroyed in stars, so its high abundance in this ageing star is very unusual. “Theorists have identified only a few, very specific circumstances, other than the Big Bang, under which lithium can be created in stars,” Prof Wolszczan explained. The second piece of evidence discovered by the astronomers is the highly elliptical orbit of a newly discovered planet around the red giant star. The previously undetected world is at least 1.6 times as massive as Jupiter. Co-author Andrzej Niedzielski of Nicolaus Copernicus University in Torun, Poland, said that orbits as eccentric as this one are uncommon in planetary systems around evolved stars. “In fact, the BD+48 740 planet’s orbit is the most elliptical one detected so far,” he added. Because gravitational interactions between planets are often responsible for such peculiar orbits, the astronomers suspect that the dive of the missing planet toward its host star before it became a giant could have given the surviving massive planet a burst of energy. This boost would have propelled it into its present unusual orbit. Team member Eva Villaver of the Universidad Autonoma de Madrid in Spain commented: “Catching a planet in the act of being devoured by a star is an almost improbable feat to accomplish because of the comparative swiftness of the process, but the occurrence of such a collision can be deduced from the way it affects the stellar chemistry. Researchers have come up with a way to glimpse the infant Universe by decoding the earliest ripples in its light. They say this can be achieved by capturing the specific radio wavelength of 21cm from the heavens. The trick is to tell the difference between 21cm waves from our galaxy and those from distant, ancient sources. The fact that “dark matter” moved faster than normal matter in the early Universe should help amplify the distant signal, they report in Nature. That could yield a look at the Universe when it was just 1% of its current age. The scientists first revealed their 3-D computer simulations on Monday at the Gamma Ray Bursts in the Era of Rapid Follow-up conference, hosted by Liverpool John Moores University. The current record-holder for the oldest object ever spotted is a galaxy named UDFy-38135539, seen in an optical image captured by the Hubble telescope. 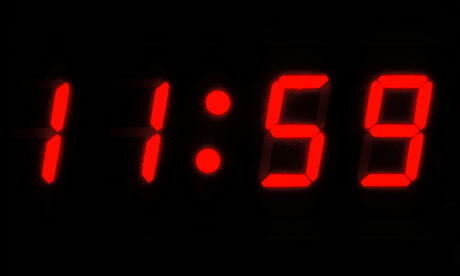 Its light escaped more than 13 billion years ago, when the Universe was already a youth of less than 700 million years. Scientists measure these literally astronomical distances with the “redshift” of a given light source; it is a measure of how much the source’s light is stretched as it races away from us in the ever-expanding Universe. UDFy-38135539 has a redshift of 8.55, but the new work shows promise for looking at stars and galaxies at a redshift of 20. However, if it works, the view will be a statistical one – astronomers will not actually see individual stars and galaxies, but rather be able to estimate how many objects of what sizes were around in those early days. But instead of seeing only the largest and brightest objects, as studies with telescopes such as Hubble typically do, it should work down to galactic haloes as small as a millionth the mass of the Milky Way’s halo. “It’s very small galaxies from very far away; it’s completely hopeless to see them individually with any telescope in the next few decades,” said Rennan Barkana of Tel Aviv University, a co-author on the study. “That’s why this is so interesting – it’s an indirect detection of the whole population of these galaxies, but it would be a very clear confirmation that these galaxies are there,” Prof Barkana told BBC News. 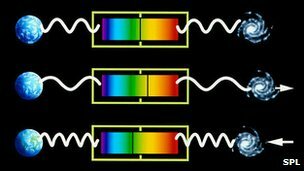 The 21cm wavelength arises from changes within the atoms of hydrogen, the Universe’s most abundant element, and one that can tell us much about the early Universe before heavier elements were formed. A key insight lies in the different speed limits for dark matter and normal matter in the early Universe, first pointed out in a 2010 Physical Review D paper. The early Universe was shaped in part by pressure waves – just like sound waves – created in the wake of the Big Bang. Like air molecules shifted around by sounds, these waves carried and distributed normal matter in regular patterns we can now observe. But dark matter, because it does not interact with normal matter, was not swayed by the waves, responding only to gravity. The distributions of dark and normal matter in the early Universe changes just where the matter – mostly hydrogen – ended up, in turn changing where the 21cm emission should come from, and how intense it should be. Averaged over the sky, there should be a greater variation in this signal than we see locally, and the new paper makes the case that heating by X-ray radiation in those early days should make this statistical fluctuation even easier to spot. 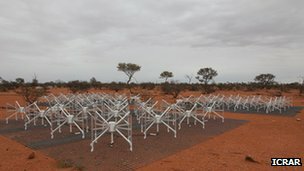 Prof Barkana said that although there are no current radio telescope arrays designed to catch these 21cm waves, several are under construction that could be put onto the task. “This whole subject of 21cm cosmology is about to open up; there are at least four different groups building radio telescope arrays focussing on about redshift 10,” he said.